Computer programmers flock to Silicon Valley, financial professionals to New York and entertainers to Los Angeles. But if you’re an engineer looking for a new job, head south. NerdWallet ranked the best metropolitan areas in the country for engineers, and 11 of the top 20 places on our list are in Southern states, including two in Alabama and three in Texas. The Huntsville, Alabama, metro area is the best place for engineers by far. This city scored 25 points ahead of the second-place city, due to a high percentage of engineers, high average salary for engineers and low rent costs. The South has a concentration of the best places for engineers. Six of the top 10 places on our list were in Southern states. Most of these areas have military bases, manufacturing centers and companies that provide competitive career opportunities for engineers. Size of the engineering industry: We looked at the number of engineers per 1,000 employees in each metro area, using 2013 data from the U.S. Bureau of Labor Statistics. Income levels for engineering jobs: We looked at the annual mean salary for engineering jobs in each area. We also considered the median gross rent as a cost of living metric to see how far the average income goes in each place. All 20 locations have larger engineering industries than the national average of 12 engineers for every 1,000 employees. Engineers in 13 of our top 20 places earn more than the national mean engineering salary, which is $92,170, and 14 places have lower median rents than the average U.S. metro area, which is $905 a month. For more information on affordability in each of these places, check out NerdWallet’s cost of living calculator. For similar studies and more, visit NerdWallet Cities. With a NASA flight center and an Army arsenal, Huntsville is nicknamed “The Rocket City” for good reason. Engineers make up 6% of its employed population and make nearly $103,000 a year, which is higher than the national mean. Median rent is the second lowest in our top 10, at around $725 a month. Huntsville, a northern Alabama city near the Tennessee border, is a hub for aerospace engineers. Drive 90 minutes south of Atlanta and you’ll hit Warner Robins, where nearly 4% of the working world is in engineering. Here you’ll find the Robins Air Force Base, which employees more than 25,000 people, and the Museum of Aviation, the second-largest museum in the nation’s Air Force. However, engineers in this area earn the lowest salary of our top 10, around $86,000 a year, which is lower than the national mean. Aside from ocean views, the Palm Bay-Melbourne-Titusville area offers career opportunities for engineers, who make up about 3% of the employed population, earn almost $94,000 a year and pay around $876 in rent. Harris Corp., a worldwide telecommunications company, and Intersil Corp., a semiconductor manufacturer, are headquartered in the area, employing thousands. Engineers in these Detroit suburbs largely make their living in the auto industry. General Motors and Chrysler have facilities in Warren, and Nissan and Hitachi Automotive Systems Americas have facilities in Farmington Hills. Engineers here earn about $87,000 a year, which is lower than the national mean salary for engineers, and pay about $829 for rent. Unsurprisingly, Silicon Valley, the technology mecca, is a great place for engineers. They make up about 4% of the area’s workforce, and earn a mean income of nearly $120,000 a year. However, residents in this area pay the highest for rent of our top 10, around $1,640 per month. San Jose-Sunnyvale-Santa Clara also made our top 10 list of Best Places for STEM Graduates. In the Lone Star State’s most populated area, engineers earn their livelihood in the energy sector at companies including Phillips 66, Marathon Oil and Kinder Morgan. Engineers in this area make a mean salary of almost $123,000, which is the second highest in our top 20. This area also made our top 10 list of Best Places for STEM Graduates. As the saying goes, “Everything’s bigger in Texas,” including the engineering sector. Engineers here take home the largest salary of our top 20 — about $141,000 a year. Midland, with key industries including aerospace, oil and gas, has one of the lowest unemployment rates in the country, 2.6%, according to the U.S. Bureau of Labor Statistics. Just 25 miles west of our list’s leading place, Decatur engineers have access to many opportunities in Huntsville. But Decatur itself is home to a United Launch Alliance facility, where spacecraft launch equipment is manufactured. Engineers make up about 2% of Decatur’s workforce, making it the smallest engineering industry in our top 10. However, it still has more engineers per 1,000 employees than the national average. Opportunities in Washington’s Tri-Cities include careers in renewable energy, manufacturing and utilities fields. The area offers a good quality of life, with engineers here earning six figures and paying about $833 in rent. Named “Ohio’s Aerospace Hub,” Dayton is home to the Wright-Patterson Air Force Base. The recently opened GE Aviation Electrical Power Integrated Systems Center on the University of Dayton campus has created more opportunities in this area. Engineers in Dayton earn about $91,000 a year and pay $733 in rent. The area also made our top 10 list of Best Places for STEM graduates. Engineers per 1,000 total jobs (50% of each overall score). Data is from the Bureau of Labor Statistics May 2013 Metropolitan and Nonmetropolitan Area Occupational Employment and Wage Estimates. Annual mean wage for engineering jobs (25% of each overall score). Data is from the Bureau of Labor Statistics May 2013 Metropolitan and Nonmetropolitan Area Occupational Employment and Wage Estimates. Median gross rent for each place (25% of each overall score). Data is from the 2013 U.S. Census Bureau American Community Survey. This study analyzed 350 of the largest metro areas in the U.S.
We considered the following engineering fields, as defined by the Bureau of Labor Statistics, in the data: aerospace, biomedical, chemical, civil, computer hardware, electrical, electronics, environmental, health and safety engineers, industrial, marine engineers and naval architects, materials, mechanical, mining and geological engineers and all other engineers. 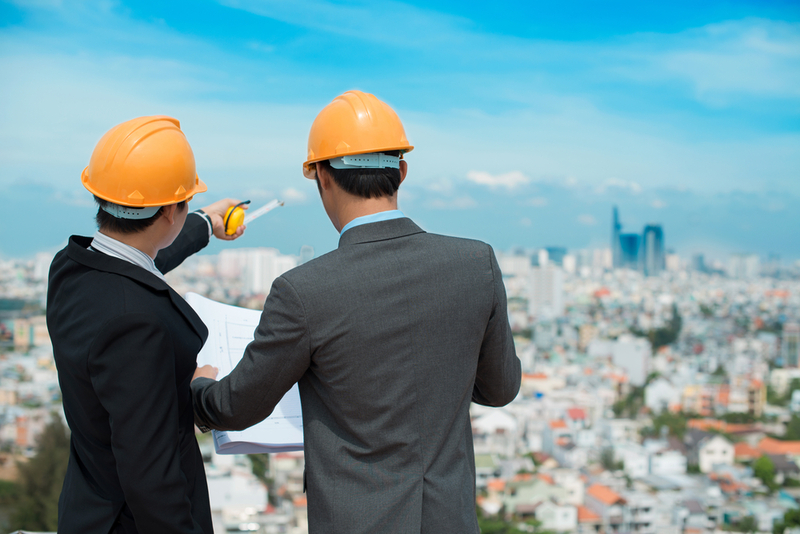 Engineers with blueprint image via Shutterstock.